I have a bit of a love affair going on with slipjoint knives. Part of the reason for that is – if I may be frank – that the framelock flipper is a pretty stale form right now. Don’t get me wrong, many blades of that stripe are beautiful, functional, and deserving of praise, but they’ve taken up and held such a large portion of the market that I’ve been dying for something different. Fortunately, just as that malaise peaked, I saw that the Viper Dan 1 & 2 were available on BladeHQ. 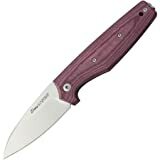 Almost immediately, I ordered a Viper Dan 2 in burgundy micarta. The knife’s name is an acronym for Daily Assorted Needs, and the design is a reflection of that intent. This isn’t a “tactical” knife, but it is a solid working tool for everyday tasks. The Dan is one of a number of designs emerging from Europe, where knife laws are typically stricter than those in the United States, typically concerning locks. While I can’t say that I’d enjoy knife laws that restrictive, I have to admit that those limitations have spurred some unique and functional designs. The Viper Dan 2 measures in at 7” while open and weighs 3.2 oz., featuring a 2.875” blade housed in a 4.25” handle. The Viper Dan 1 is nearly identical, but offers a more traditional drop point blade shape. I’ve long been a fan of the modified wharncliffe as far as blade shapes are concerned; they strike a fine balance between tip strength and piercing, and the slight but continuous belly of the blade is suitable for a wide range of tasks. This iteration of the wharncliffe is executed quite well. All Viper by Tecnocut knives are (as far as I know) produced in Maniago, Italy. Both blade shapes feature a partially flat grind. While I prefer hollow ground blades, it is refreshing to see a well-done flat grind on a blade thin enough to support it. I haven’t encountered any difficulties in cutting tasks, regardless of whether I’m using the Dan for food prep, breaking down cardboard, or just opening packages. Every aspect of the blade is meticulously ground. Even the swedge (an aspect of the grind that is easy to screw up) is symmetrical, and meets up with the rounded spine cleanly. If you can’t tell by this point, I’m biased towards simple, working steels. N690 is certainly in that class, despite widespread use on high end production and even handmade knives. It won’t require as much care as 8Cr13MoV or Aus8a, but I do recommend regular stropping. I’ve never experienced rust or staining on any of my knives with N690. Overall, it demonstrates a great balance between ease of care, rust resistance, edge retention, and toughness. The handle is formed of two contoured slabs of burgundy micarta over nested steel liners. When it first arrived, the color of the handle scales was somewhere between red and pink. More than a month of use has darkened that color to a subdued purple. Micarta is one of my preferred handle materials for precisely this reason; it absorbs the oils in your hand and forms the equivalent of a patina. When polished, the pores of the material are closed and this process won’t occur. Fortunately Viper left the handle slabs just rough enough to facilitate the “aging” process. If this material isn’t to your taste, don’t worry: the Dan is also available in carbon fiber, green G10, and silver twill/G10. Contoured handles were once a rarity in high-end production knives, but fortunately most companies are starting to see the ergonomic benefits of doing so. The contouring on the Dan is executed perfectly; the handle slabs are symmetrical, smooth, and comfortable. There are no sharp corners, and the only point that could generate a hotspot is the pocket clip (but no more than any other clip). Most folding knives that are comfortable in the hand are likewise comfortable in the pocket, and this is no exception. The clip provides plenty of tension, but isn’t so tight that I’m worried about tearing a stitch. If I had to find a complaint it’s that the Dan is a bit long in the pocket. Not only is the handle pretty long for a relatively small blade, but the extended tang compounds the issue. It’s never been a real cause for worry, but I feel some attention should be called to it. It’s comparable in length to the Paramilitary 2 (though nowhere near as wide). As much as I love slipjoints, I’m always slightly disappointed that I can’t access the blade with one hand. It’s not always essential, but sometimes the extra step is a tad inconvenient. The process of “pull pocket slip out, pull knife out of pocket slip, put pocket slip back in pocket, open knife, cut,” looks pretty silly next to “pull knife out of pocket, open knife, cut.” That said, most of the slipjoints I’ve handled that can be opened with one hand are less than cooperative, and by extension aren’t fun to fidget with. In this, the Viper Dan is different. The blade is deployed by rotating the extended tang with your thumb, similarly to a friction folder. Machining on the tang (jimping) ensures that your finger doesn’t slide off mid-deployment. Overall, the Viper Dan is quick, easy, and even a bit addictive to open and close. Viper chose their patented Action Stopper system instead of a lock on the Dan series. How it works is pretty simple: each of the liners has a spring tab with a ball detent, similar to a frame or liner lock. These detent balls drop into corresponding slots in the blade at the closed, half-stop, and opened positions. While the mechanism isn’t fundamentally new, it does feel more secure than other iterations of this system that I’ve handled. If I had to make a comparison, I’d say it offers as least as much resistance as the Victorinox Pioneer. The advantage of this system over a traditional backspring is twofold: one, it allows for a wider blade to be housed within the handle, and two, it accommodates space for an extended tang (much like what you’d see on a friction folder). If you grip the Dan with your thumb resting on the spine of the blade, you’ll have a strong slipjoint mechanism, a half stop, and the pressure of your own thumb keeping the blade away from your fingers. On the whole it’s a very secure system. Typically, the Viper knives that get the most attention are the collaborations with Jesper Voxnaes (for good reason). Thus far, the Dan series of knives haven’t been hit by the spotlight, and I think that’s truly a disservice. I can’t say this often, but I don’t have any real complaints about this knife. The design is unique, the materials are top shelf, and it’s manufactured to very tight tolerances. Slipjoint knives are the sort of thing that I can recommend to anyone. Even people that don’t like slipjoints occasionally need to go somewhere where locking folders are discouraged (or illegal), so most knife nuts should have at least one non locking folder in their collection. Should this knife be it? That I can’t say. But I can say that if you want a slipjoint that can scratch that flipping itch, this should be it. It sells for just over $100 USD and is a fantastic value at that price point. I recommend purchasing the Dan 2 at BladeHQ or Amazon. Please consider that purchasing anything through any of the links on this website helps support BladeReviews.com, and keeps the site going. As always, any and all support is greatly appreciated. Thank you very much. I have the exact same knife, bought primarily for travel to the UK, NYC and other places that aren’t so knife-friendly. It’s such a beautifully made knife and useful design that it sees a lot more pocket time than I expected, though–it’s in my pocket today at the office, for example. It’s also the only knife I own that regularly gets compliments and positive inquiries from non-knife people, FWIW. Reviews in English were really hard to find when I bought mine, so thanks for publicizing a design that deserves some good press. Viper makes some gorgeous knives, and I’d never really considered them (or even knew much about them) before this. Thank you, Kat. I was impressed with this design when I handled it at the 2015 Blade show and was excited to see Grayson take a shine to it. I am glad to hear you enjoy yours as well. Thanks for the comment. I don’t know if I would travel with this knife (I’d hate for it to be confiscated) but it certainly meets the legal requirements for several countries that aren’t quite as knife friendly. It also receives a fair share of compliments from non-knife-people, so that’s a plus. I have wondered for a while now why this knife wasn’t more popular, even here in the US. Finding reviews is nearly impossible, so thank you for doing this one Grayson! You have solidified my resolve to get this one. You even reviewed the exact model I have been considering (wharncliffe, micarta). I’ll channel my inner Tony for a minute and say that the handle:blade ratio seems pretty bad. I didn’t realize the handle was so long until you pointed it out. The pocket clip seems like a pretty great design – does it keep the knife from swinging around a lot in the pocket? I have had that problem with some longer knives when using deep carry clips. For example, my pm2 always felt secure until I switched to a deep carry clip, and then it felt like it was always swinging around. How does this knife do in that regard? When I was looking at this knife a few months ago, it seemed to be in low supply (particularly the cf). I checked after I read this review and it seems that most of the models are in stock at all the normal online retailers. Thanks again for reviewing this one! Dan has always done a great job reviewing a diverse and interesting array of knives, but adding different reviewers and perspectives has really taken bladereviews to a new level in this regard. You guys are all doing an awesome job. For whatever reason these Italian knives don’t get a ton of press (maybe it is because they don’t market them that well, maybe it’s because they are not a titanium framelock flipper, maybe it’s the lack of a collaboration with a big USA designer, etc), but I have always dug these knives, and I really liked the Dan 2. I have a Fantoni Dweller (even smaller slipjoint by Massimo Fantoni) and that’s one of my favorite gents folders. Anyhow, thanks for the kind words. I am glad you have enjoyed the addition of Grayson, Ben, Chad, and the other guys I have working on reviews here. I agree that it has really broadened the perspective of the website and I’m thankful to have such high caliber guys writing with me. I look forward to sharing many more reviews, and especially reviews of stuff a little off the beaten path like this Dan 2. Cheers! –	Yes, the blade/handle ratio is pretty wonky. I don’t mind it, but it’s long in the pocket. –	I haven’t experienced any problems with the pocket clip. I know the phenomenon you’re describing, but the Viper isn’t so heavy that it’s a concern. Beautiful knife. Like you I’m really starting to like the slip joint knives as well. My first slip joint was a Spyderco UK Pen and I’ve been carrying it quite a bit lately. Now I have another brand to consider…I love the looks of this one so I’ll be buying one ASAP. Beautiful knife, picked up the last one in carbon fibre recently from the wonderful folks over at AG Russell. Did yours have a terrible asymmetrically ground edge? The difference between sides towards the tip of the blade was extremely off on mine, fixed on my edgepro so not a big deal for me. Aside from that, the fit and finish is pretty near perfect, minus a tiny tiny defect in the otherwise perfectly cut carbon fiber on the inner part of the handle scales of one side. The handle is a little long, throwing of the blade:handle ratio but it is very well balanced (right at the choil for me) and the long handle makes me feel like I have a really secure grip. No problems with the pocket clip for me, though i usually carry it in a leather sleeve. Overall a really great knife, I have to take a minute in the morning to decide whether to take out my 940-1 or this DAN2!